Quick, Packaged and Healthy Beverages are about to Capture the Global Bars and Cafes Services Market. Changing consumer lifestyles and rising preferences for quick, packaged and healthy beverages have led to increasing demand for ready-to-drink (RTD) products. RTD tea and other RTD products are growing rapidly in the bars and cafés industry. Companies in the market are working on launching such drinks in the market to cater to the working population. 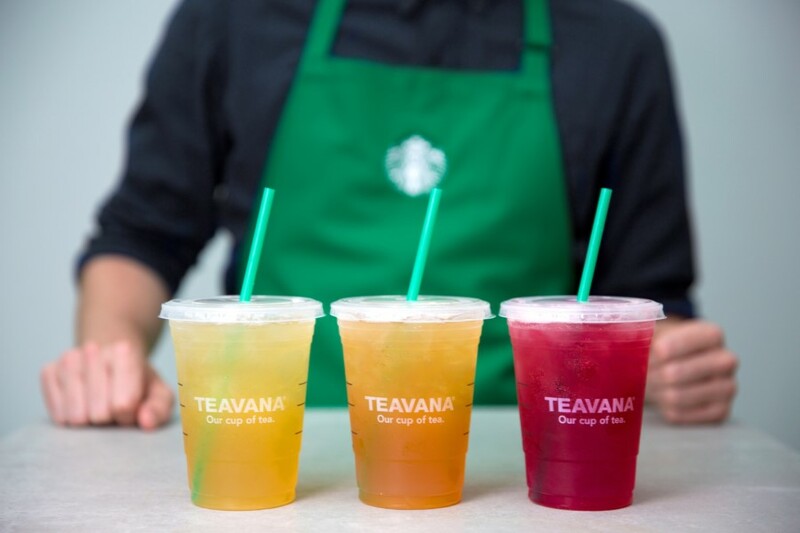 For example, in June 2016 Starbucks and Anheuser-Busch collaborated to launch Teavana Ready-to-Drink tea by 2018. Café bar and coffee shop establishments are capitalizing on rapidly growing RTD market that grew at 16% CAGR over the past five years. The bars and cafés industry offers alcoholic and non-alcoholic beverages and limited food services for immediate on-premise consumption. This industry includes bars, taverns, pubs, night clubs and lounges but does not include civic or social association bars, beer, wine and liquor stores and restaurants and nightclubs that do not serve alcoholic beverages. The bars and cafés market can be classified into the following: Drinking Places (Alcoholic Beverages) – Drinking places including bars, taverns, pubs, nightclubs and lounges that serve alcoholic beverages with limited food services. Snack and Nonalcoholic Beverage Bars – Snack and nonalcoholic beverage bars prepare and serve snacks and nonalcoholic beverages. This includes coffee shops, patisseries, cookie, donut, ice cream and pretzel shops and soft drink or juice beverage bars. According to The Business Research Company’s Hospitality Consultant, Ramesh Yelugoila, coffee shops are increasingly used for informal, formal business meetings. Businesses are encouraging discussions and client meetings in coffee shops for various reasons such as their informal environment, cost saving and general convenience. Coffee shops are catering to businesses by offering services such as Wi-Fi, quiet surroundings, prior table reservation services and private space. For example, in September 2016, Starbucks collaborated with Microsoft to launch the Starbucks For Outlook Add-In that will allow businessmen to arrange meetings in any Starbucks outlet while using Microsoft Outlook. Going forward, this trend in the changing business environment is expected to drive the market for the bars and cafés market. Among a lot of small and big competitors Starbucks Corporation was the largest company in the bars and cafés market with revenues of $19.2 billion for the financial year 2015. Its growth strategy is to expand its footprint and enhance customer experience. The company partnered with Princi, the renowned boutique bakery which will be the exclusive food offering in the stores. Also, the Starbucks Card and other loyalty programs are being implemented to attract and retain customers. The Business Research Company expects the global bars and cafés market is expected to grow to $530 billion in 2020. The Americas was the largest region in the bars and cafés market in 2016, accounting for one third of the market share. This was mainly due high disposable income in this region leading to increased spending on bars and cafes. Specialist coffee shops and bars also drove the bars and cafés market in the region. The chart below shows the year-on-year growth of the global bars and cafés market during 2016 - 2020. 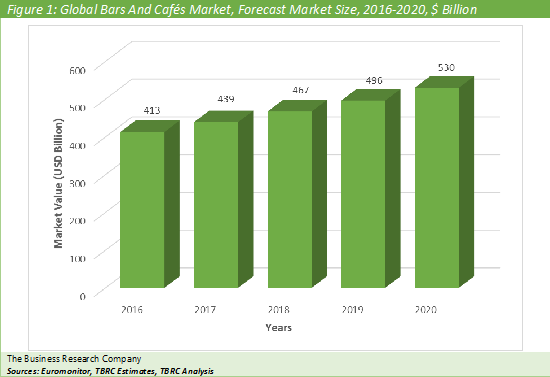 Global Bars and Cafes Services Market Briefing is a detailed report giving a unique insight into this market. The report is priced at $750 for an individual user. To use across your office the price is $1500 and $2000 if you wish to use across a multinational company. About The Business Research Company Visit TheBusinessResearchCompany.com, mail info@tbrc.info or call +447443439350 or +918897263534 or +919160996838 for more information on this and many other titles. The Business Research Company is a market research and intelligence company, which excels in company, market and consumer research. It has research professionals at its offices in the UK, India and the US as well a network of trained researchers globally. It has specialist consultants in a wide range of industries including manufacturing, healthcare, chemicals and technology. The Business Research Company's management has more than 20 years of varied business research experience. They have delivered hundreds of research projects to the senior management of some of the world's largest organizations.